Have you ever gotten the munchies at three in the morning but too lazy to actually cook something and the last pack of instant noodle has already been consumed the day before when you were in the lazy mood as well? Do I have good news for you. This is the ultimate life hack for when you are craving cakes but cannot bother to bake a humungous one and wait for 45 minutes, or when your oven is acting up. 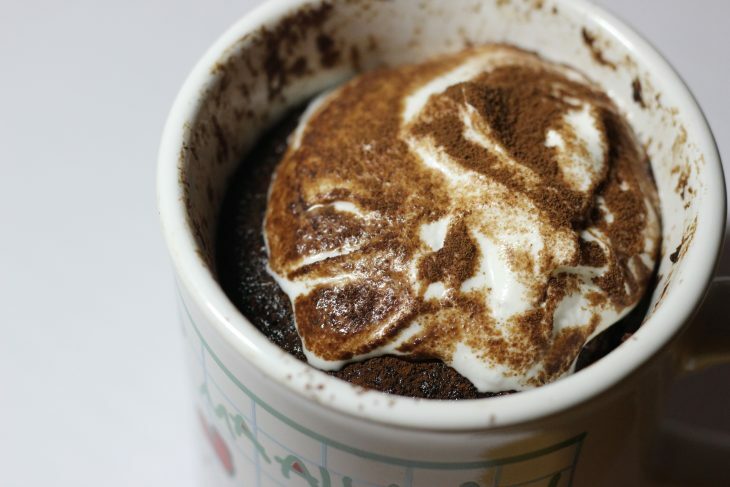 May I introduce, the glorious mug cake! Over the years, I have tried several recipes but always ended up with hard-as-a-rock texture; but, finally I have come across an amazing recipe that guarantees moist, oven-baked-like cakes every time. Let’s dive right in. Add the cocoa and whisk everything together to a glossy mixture. Add the chocolate chunks/chips and toasted nuts of your choices. You can also go all the way by adding in M&M if you want to. Slightly whisk in the milk. Lastly, mix in the flour, baking powder and a pinch of salt till smooth. Pour the mixture into your favorite (microwave safe) mug. Set the power on high and leave them in there for ~1 minute. The batter will rise and look like it will overflow but it wouldn’t; it will collapse as soon as you turn off the microwave. Take the mug out and if everything is done properly, we should have a very close resemblance of an oven-baked chocolate cake. Top it with a bit of whipped cream and/or ice cream and dust it with cocoa powder for the aesthetics. And there you have it! Five minutes to prepare, one minute to “bake” and a cake is born. You can also alter it by making a confetti or red velvet version. The possibilities are endless. Enjoy!